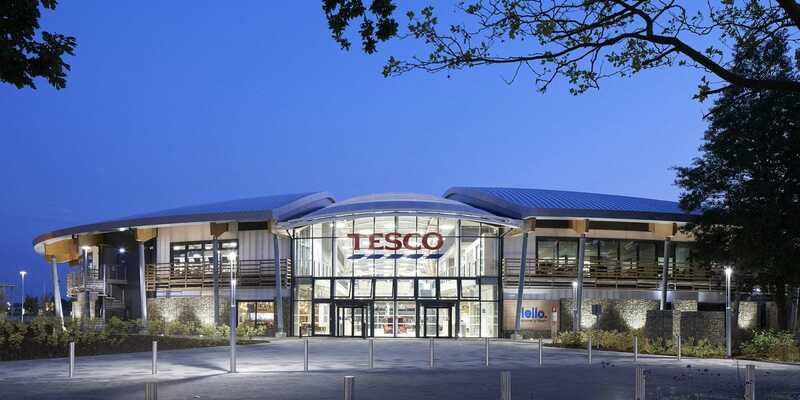 A staff academy, well-being and experience centre creating a new heart to Tesco’s head office campus. 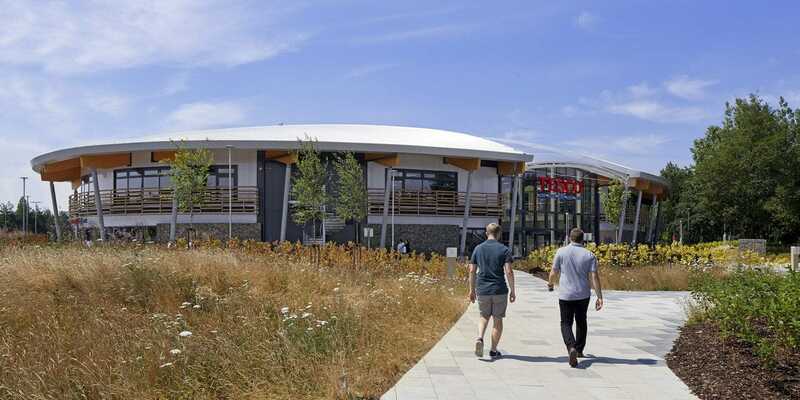 The Heart Building is an innovative staff well-being and quality assessment centre designed by LOM to encourage interaction, collaboration, and creativity at the heart of Tesco’s head office campus in Welwyn Garden City. 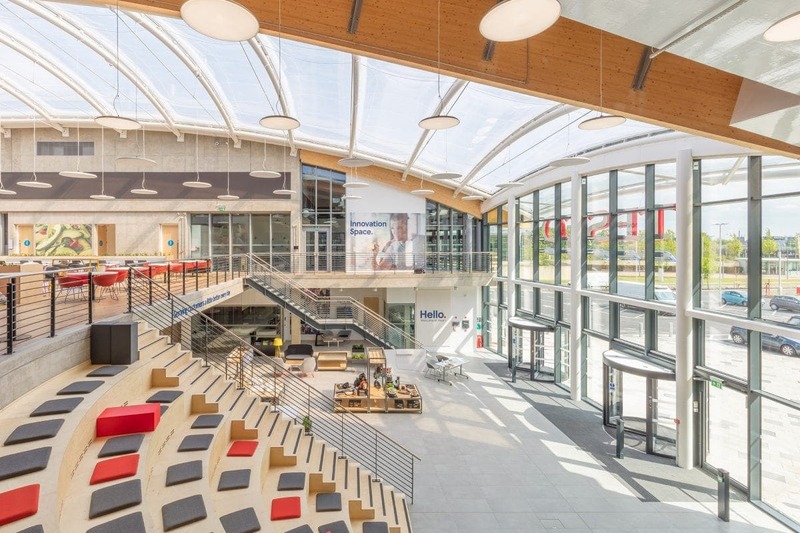 At the core of the building is a dramatic central atrium offering a flexible, communal, internal ‘street’ area where staff and visitors can network on a daily basis, and which also serves as a space for events and presentations. 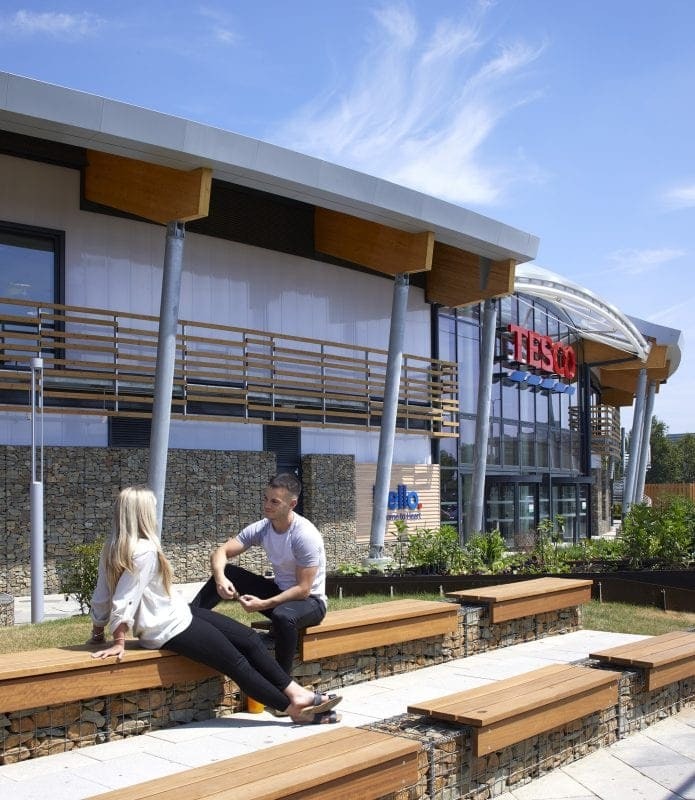 The project incorporates the Tesco Academy, a facility which hosts learning and training opportunities for staff. An event space occupies the apex of the first floor plan, while at the opposite end of the floor is a new, state-of-the-art gym. 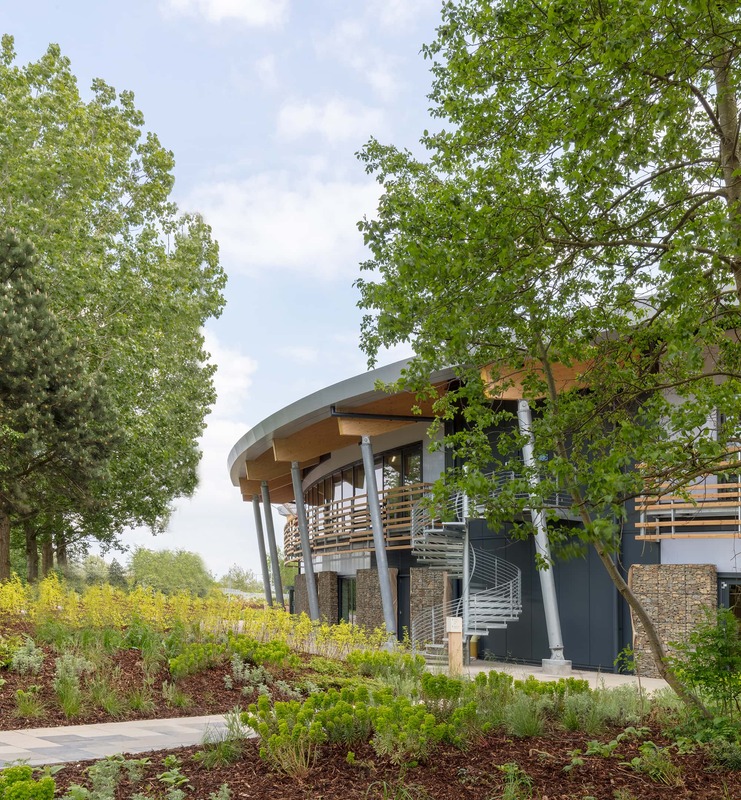 The gentle, curving profile of the new facility and the considered landscaping surrounding it helps to soften the context of existing office buildings on the campus, while providing areas for staff and visitors to sit in a pleasant external environment. The building façade incorporates a series of balcony-like walkways accessed by spiral staircases. 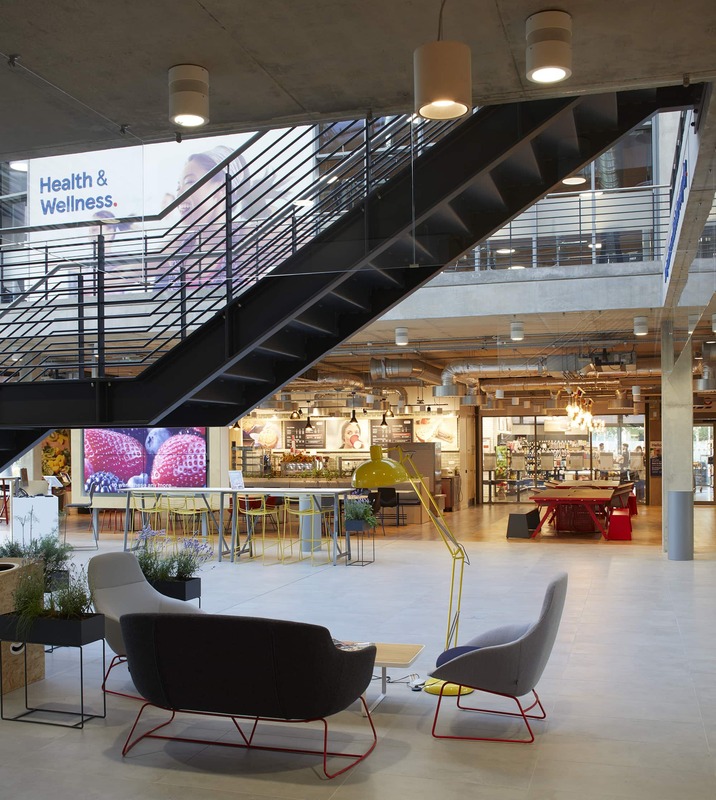 The interior design presents a raw industrial look with exposed concrete structure topped by a timber roof. 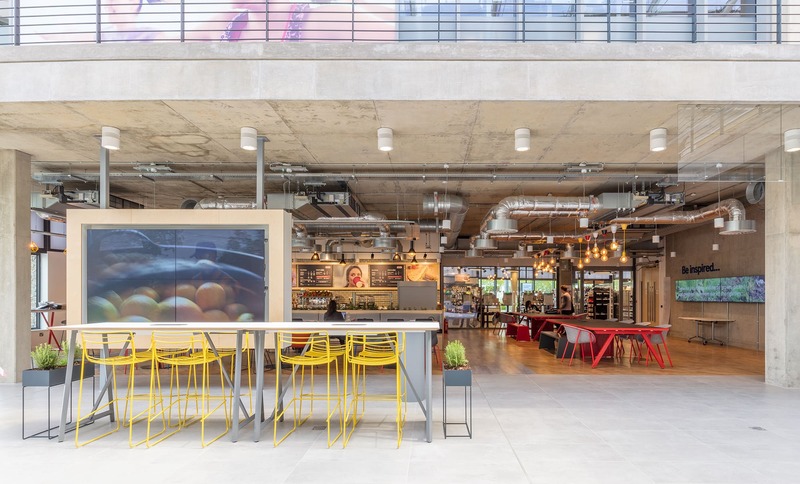 A restrained palate of building finishes, including galvanised ductwork and plywood joinery, are further complemented by the furniture’s thin black metal detailing, natural tones and flashes of primary colour. 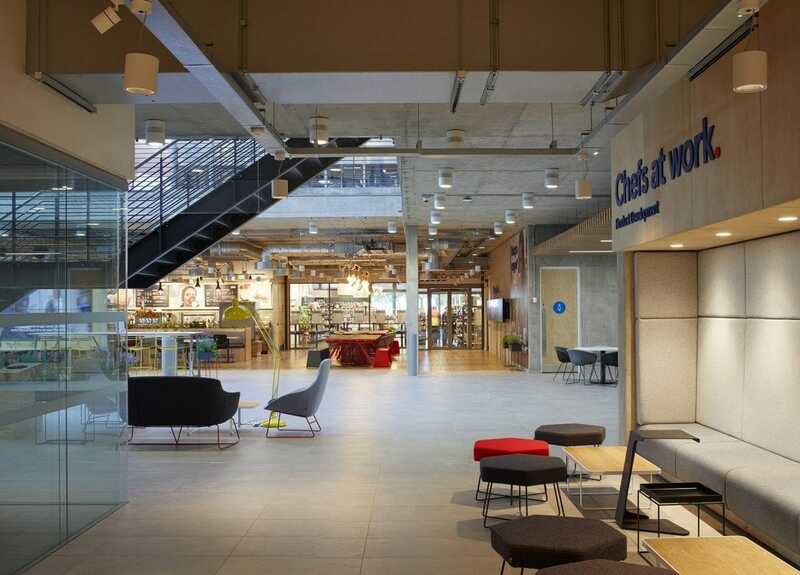 This ‘refined industrial’ aesthetic signposts Project Heart as a new kind of collaborative space for Tesco’s employees. 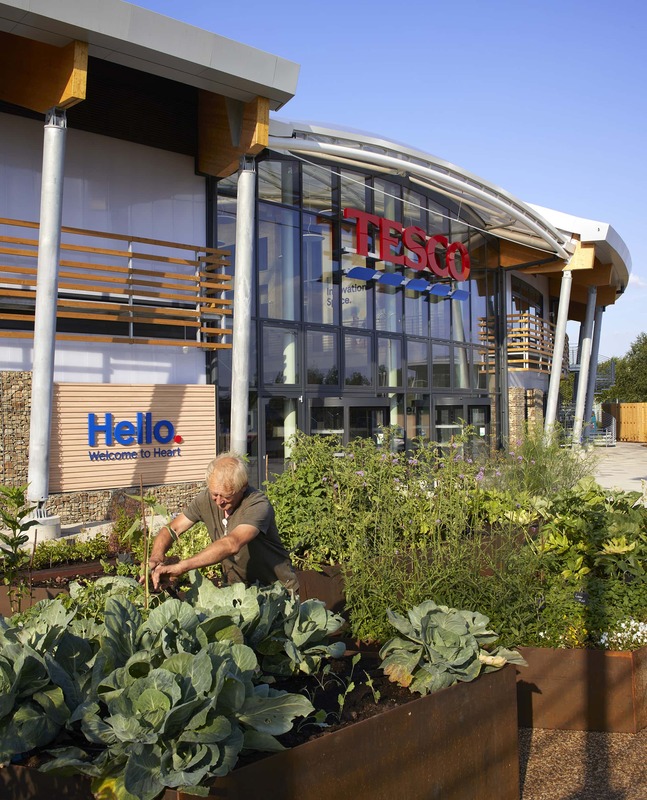 We worked closely with Tesco to develop a space that balances corporate communications and the brand with Tesco’s aspiration for an open, creative & inspiring environment. 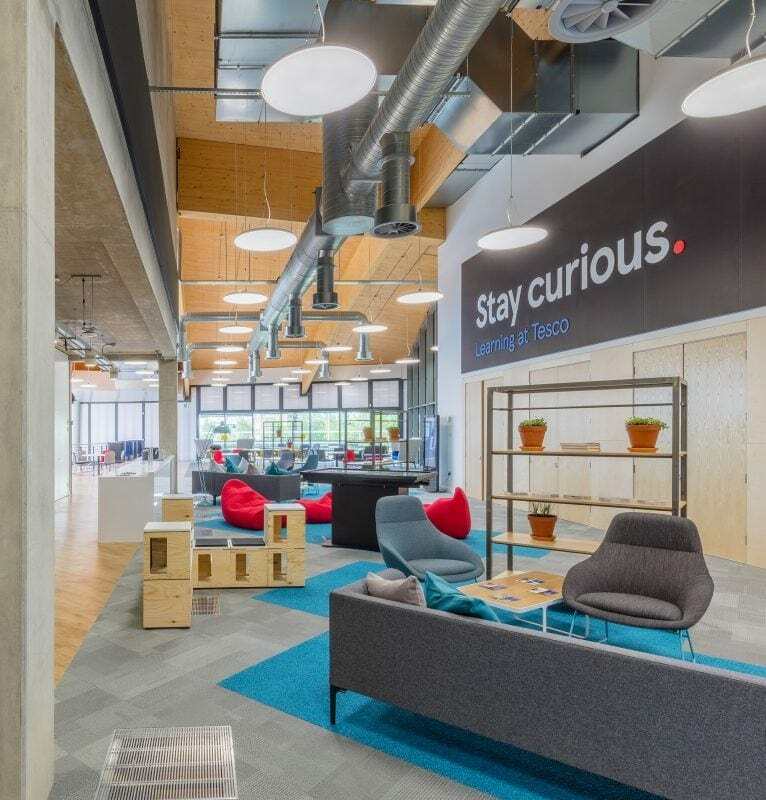 The timber and concrete of the building are complemented with the balanced use of colour in furniture, fittings and acoustic materials, and in the application of bold graphics. 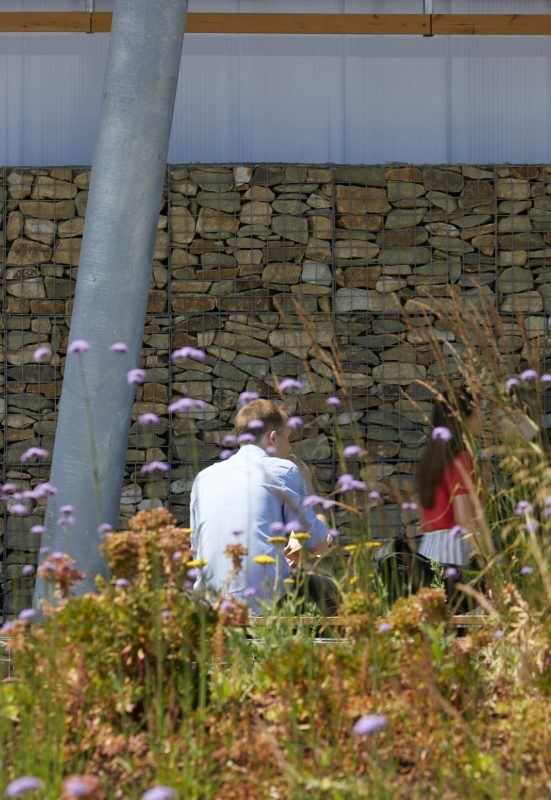 The building form has soft, welcoming lines and natural stone and timber materials as core components. The glulam timber roof structure forms an attractive, flexible, clear-span space internally. 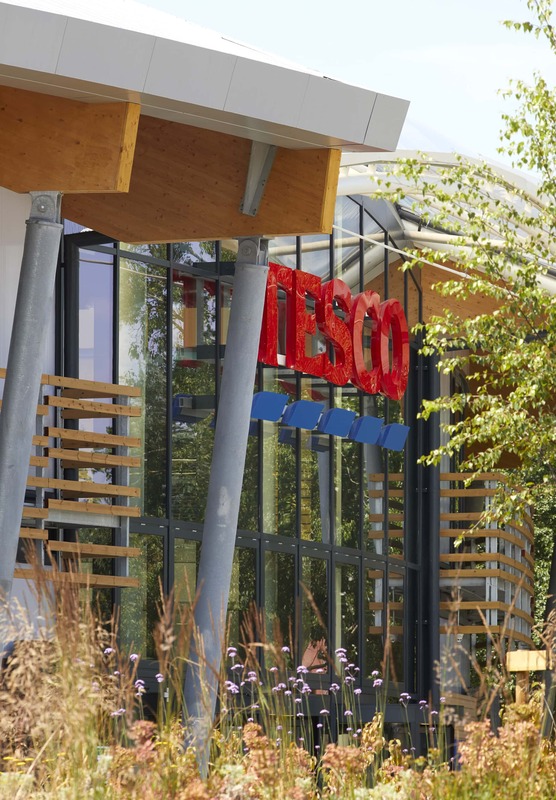 To complement the large areas of external glazing, Rodeca polycarbonate panels have been used to create a translucent façade. 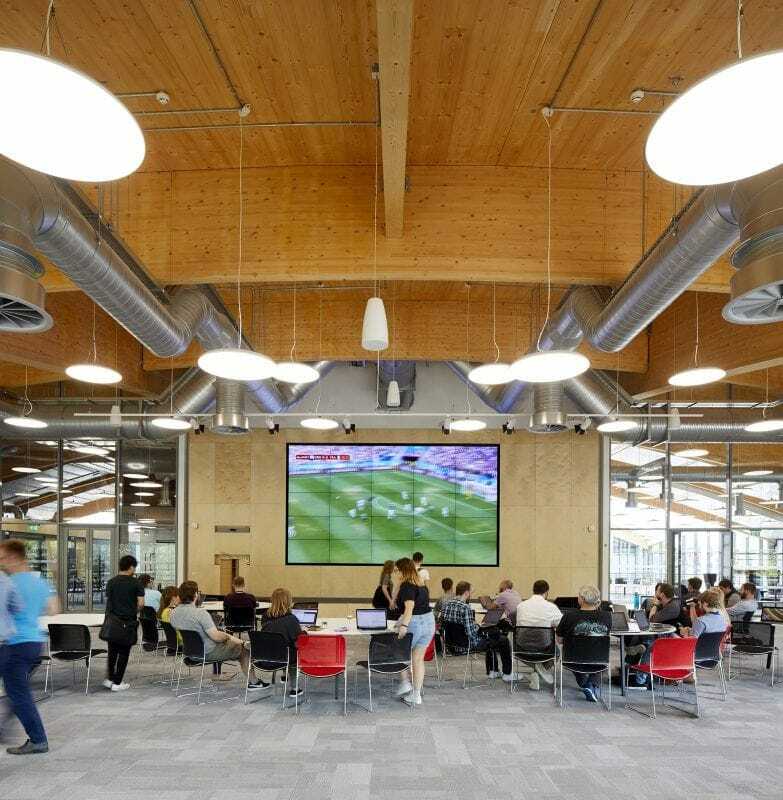 This allows natural light to enter through the walls during the daytime and artificial light to pass out through during the evening when the building appears to ‘glow’ from within from light animated by the movement of people inside. Please find ‘The Heart Building’ press release.